The most awaited sequel in history (just as every other Star Wars film since the first has been), Star Wars Episode 2: Attack of the Clones is the direct follow-up to 1999's Episode 1: The Phantom Menace. Largely considered a disappointment in everything but box office performance, The Phantom Menace was lambasted by critics and fans alike while racing to near-record box-office grosses worldwide. While The Phantom Menace, in retrospect, is fine for what it is, - a set-up to the last two movies of the second (first) Star Wars trilogy - there is a large amount of nervous anticipation for Attack of the Clones. Where will the film fall in the Star Wars pantheon? Will it become a modern classic, as the original Star Wars and its superior sequel, Empire Strikes Back, have become? Will it fall in the middle, as the third (sixth) film, Return of the Jedi, did? Or will it follow its predecessor and be a disappointment? Early word is that Attack of the Clones reaches back for a bit of the magic that so compellingly propelled the first three films: action, adventure, and some romance. Diminished is the mind-numbing exposition that was so forced in The Phantom Menace, which, while understandably present, was done in extremely clumsy fashion. Also rumored to be greatly diminished is the role of Jar-Jar Binks, something that, if true, will be the most welcome news for Star Wars fans since it was announced that George Lucas would be making the prequel trilogy. 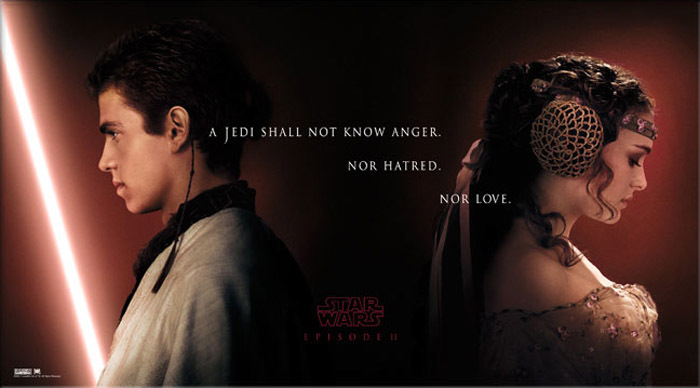 Centered on the two major issues that will shape the Star Wars universe that comes after it, the romance between Anakin Skywalker (Hayden Christensen) and Senator Padme (formerly Queen) Amidala of Naboo (Natalie Portman), and the slow turn of Anakin Skywalker to the dark side of the Force, Attack of the Clones also features appearances by familiar characters in the Star Wars universe, Obi-Wan Kenobi (Ewan McGregor), Yoda, R2-D2, C-3P0, and Supreme Chancellor (later Emperor) Palpatine. Additionally, characters familiar from The Phantom Menace return, some with increased roles, including Mace Windu (Samuel L. Jackson), Shmi Skywalker (Pernilla August), and yes, Jar-Jar Binks (Ahmed Best). Liam Neeson's Qui-Gon Jinn is also expected to make an Alec Guinness-esque cameo in Attack of the Clones. In addition, Jimmy Smits will make an appearance as Senator Bail Organa of Alderaan, Leia's eventual adoptive father. As evidenced by the title, the film also will include the prelude to The Clone Wars, the introduction of said clones. There is little doubt that Attack of the Clones will be one of the largest-grossing films - if not THE largest grossing film - of 2002; what remains to be seen is where it will fall in the top ten all-time or, failing that, among the Star Wars franchise of films. Will it match the $431 million take of The Phantom Menace? Will it best Star Wars' $460 million as the top-grossing film in the series? Or will it suffer from the lingering disappointment that remains from The Phantom Menace?